Two billion years ago, on a geochemically bubbly youth Earth, a simple bacteria engulfed its neighbor. Rather than dissolving into nutrients, against all odds the eaten organism formed a symbiotic partnership with its host and metamorphosed into specialized tiny factories called organelles. 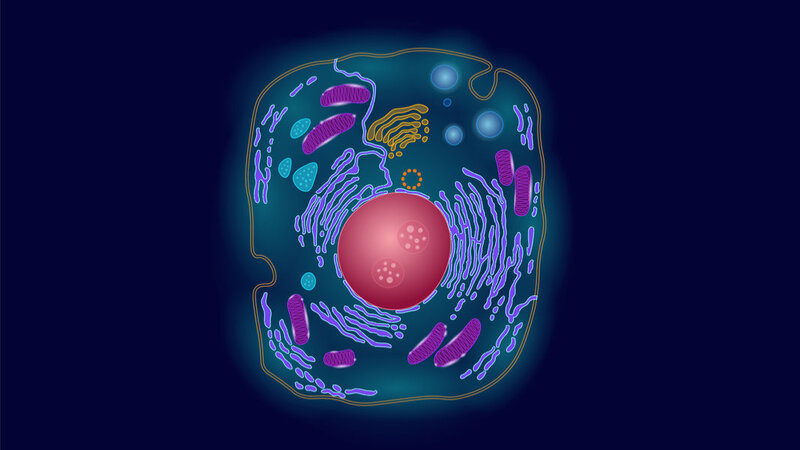 The eukaryotic cell was born. Despite their exotic name, eukaryotic cells are intimately familiar to humans. As the building blocks of most animals and plants, these cells have evolved into complex molecular cities, chock full of organelles dedicated to the foundations of life. The nucleus, for example, houses our genetic material. Ribosomes, pit-like nuggets with incredibly intricate structures, serve as protein-building factories. Molecular shuttles zoom around the cell’s viscous interior like flying cars, efficiently connecting one compartment with another. For two million years, this was the de facto way of sustaining complex life. Life is about to get a serious upgrade. This week, a German team headed by Dr. Edward Lemke at the European Molecular Biology Laboratory described an entirely synthetic organelle inside living cells in Science. With roots in nature, these artificial factories nevertheless explode the capabilities of normal cells by overhauling the basic genetics of life. Super-cells equipped with these organelles not only process normal DNA letters—A, T, C, G—into natural proteins; they’re also capable of expanding the genetic code and using designer building blocks to construct entirely new proteins without interfering with the cell’s normal functions. “This basically achieves a cell which simultaneously uses two distinct genetic codes for different proteins it produces,” Lemke and his colleagues, Christopher Reinkemeier and Gemma Estrada Girona told Singularity Hub. That’s not even the crux. In theory, the strategy could work to concentrate any designer function into cells. Because the concept doesn’t disrupt a cell’s normal way of life, the team believes that scientists can now engineer custom compartments that execute completely synthetic tasks inside cells—such as pumping out life-saving drugs, biofuels, or encoding artificial photosynthesis. “We can now start dreaming of designing all types of organelles to equip cells with new functions,” they said. “This seems like an amazing step forward for both organelle engineering and genetic code engineering,” said Dr. George Church to SH, the “godfather” of synthetic biology at Harvard University who was not involved in the study. This isn’t the first time synthetic biologists overhaul natural life. Back in 2017, a team from Scripps Research Institute expanded the base DNA code, adding two more letters, X and Y, into the mix. Pioneered by Dr. Floyd Romesberg, the team engineered semi-synthetic life forms that could decipher those unnatural letters to make glow-in-the-dark proteins that light up an otherwise-normal cell in a brilliant green. “This was the smallest possible change we could make to the way life works—but it is the first ever,” said Romesberg at the time. These herculean efforts have so far only worked in bacterial cells, which are magnitudes simpler than ours. “As mammalian cells are also much more complex, it will also not be easy to transplant this [elegant] approach to more complex eukaryotic cells in the near future,” explained Lemke. Rather than messing directly with DNA code, the team took an incredibly clever approach: recapitulate the origins of eukaryotic cells, starting with proteins. The birth of a protein kicks off inside the nucleus, jam-packed with DNA. An extraordinary dance of molecules “read’ portions of the DNA and transcribe the code into a more portable version—messenger RNA. Like letter-carrying doves, these short strands of molecules fly to distant parts of the cell to recruit an army necessary to kick off the whole protein-making process. Central to the code of life is how DNA “translates” into proteins, which are built from amino acids. DNA has four letters arranged in combinations of threes; like Morse code, these combinations in turn recruit a very specific “carrier,” tRNA, that shuttles the appropriate amino acid to the protein-building factory. Simultaneously, it recruits a powerhouse protein—also tailored to a specific amino acid—that provides the chemical reaction necessary to link individual building blocks into chains. I like to think of my fingers as a tRNA-powerhouse protein combo that let me grab an amino acid Lego block, while providing sufficient energy to press down and construct a Lego protein piece-by-piece. There’s one more critical aspect in this story: the “stop codon.” As its name implies, this molecular oddity dramatically halts the entire protein-building machinery. For a protein-making factory to continue manufacturing its product, the stop codon has to be suppressed. In all, life gave us only 20 different amino acids. For synthetic biologists, incorporating new ones—those that help cells glow, for example—is the ultimate goal towards building entirely new organisms that serve our needs. Lemke and colleagues focused on solving one mind-throbbing problem: how do you let a cell incorporate totally weird unnatural amino acids only into a particular protein and not everything else? Their inspiration came from stress. Not the tear-out-your-hair kind, but a type of chemical trigger that cells really don’t like. Under stress, many cells form little aggregates called stress granules that self-segregate inside the cell. They automatically form a sort of organelle—an entity inside the cellular city without walls that still communicates with other parts of the city. In biochemical terms, this is dubbed “phase separation.” The process lets molecules communalize into functional, fog-like “safe houses” inside the chaos of a living cell. Adding components from stress granules wasn’t enough—the team also incorporated another molecular tweak to further trigger phase separation. “As when a raindrop forms by phase separation, the air around still stays humid, and not all water goes to the drop, just most. Only, when we combine both approaches we obtain a large organelle-like structure that is spatially quite constrained,” they explained. This is key: phase separation concentrated all the unnatural protein-building components to the wispy organelle and away from natural protein building mechanisms. To specifically tag a single messenger RNA—that is, eventually a single designer protein—to the organelle, the team added a tidbit of code into the molecular carrier dove, dubbed “ms2,” which in turn gathered tRNAs and other components into the artificial organelle. The process essentially formed an organelle completely different than those naturally evolved. If a messenger RNA “dove” gets lost inside the cellular city, the stop codon kicks into effect and nixes protein building. In other words, the stop codon is only suppressed inside artificial organelles, allowing the incorporation of artificial amino acids into a given synthetic protein. Everywhere else, the cell naturally inhibits any artificial, bastardly protein building. “In mammalian cells it has so far not been possible to select a specific [messenger] RNA” without jeopardizing natural proteins, the authors explained. If your brain hurts, mine does too. Thanks to billions of years of evolution, tinkering with the usual order of molecular processes is akin to dueling all the forces of mother nature—it’s damn hard. But Lemke’s team, among others set on engineering new life, shows that it’s possible. We’re no longer under the control of evolution; rather, we can directly program functions into cells that may take eons (and luck) to evolve. In all, reigning over evolution only took five genetic tweaks: in the world of synthetic biology, that’s child’s play. As our understanding of biological phase separation grows, we can expect man-made organelles 2.0 that are far more refined, selective, and compatible with natural cellular life. Tinkering with custom organelles is only one way scientists are rewriting life. GP-Write, a program led by Church, is rapidly developing more efficient DNA synthesis technologies that could one day lead to super-cells resistant against most viruses.